Comments on the economy and social progress in Newfoundland and Labador, Canada. Also thoughts on the OECD's, ABS', and others' thoughts on community well-being and social progress. What do we mean by poverty? Newfoundland and Labrador labour markets continued to weaken in December as seasonally adjusted person-years of employment fell to just over 217 thousand. This weakness somewhat mirrors the recession that is occurring throughout the world but in our case it reflects the decreasing demand for our natural resource exports and associated primary manufacturing. An interesting feature of our employment figures are that they include LDCers (Long Distance Commuters) who are permanently resident here by work in Alberta. Recent stories on CBC have featured these workers being laid off and facing hardship as their current lifestyle depends on high-paying jobs which just vanished. 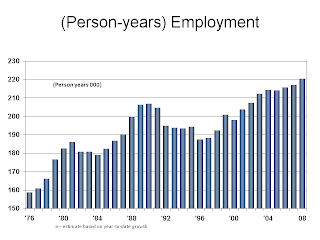 This downward trend in "employment" which began around the middle of 2008 is expected to pick up speed as during 2009. Abitibi-Bowater workers from the Grand Falls-Windsor mill will begin to show up in the January LFS figures as will workers associated with operations that supply the mill. Just as people like to talk about a multiplier effect associated with large project development the same effect ultimately exists when these operations close down. In addition, fewer workers putting in less hours of overtime coupled with the cutailed consumption of laid-off workers will further curtail employment. Readers should carefully watch the fishing sector for two reasons: firtsly, the sales and the price of the industries products are very sensitive to downturns in the economy and secondly, parts of our provincial industry are tied to the Icelandic industry and banks and that economy has been experiencing a full-blown depression. In some ways one might think that the Newfoundland and Labrador economy is more immune to the international recession since the public sector plays a larger role. However, the Provincial Government is facing large wage settlements coupled with very diminished oil revenues. Government may quietly allow employment levels to fall as workers retire under the banner of promoting increased efficiency. The Finance Minister has already noted the need for such efficiency. Such actions if they were to occur would aggrevate labour market opportunities especially for recent university graduates. Unfortunately all this adds up to a rather gloomy prediction that the same seasonally adjusted employment figure in December 2009 will be about 212,000. How quickly the economy and our economic fortunes can change! Ever optimistic we hope that the commodity prices, the Canadian dollar ( in relation to the US$) and the stock market will soon bottom out and that we will revert back to our previous expansion path. Under this scenario the current recession and fall in prices is an economic side-track on a path of economic growth and prosperity. However, another possible scenario is that the path we were on, at least in terms of prices, was a side-track fuelled by G8 easy money policies and low interest coupled with an over-reliance on self-regulating private financial markets. Under this second scenario the current fall in stock prices is right on track with the longer term trends and one should not expect the stock market to follow the post-90's growth path built on easy finance but it should follow this longer term trend. If this second scenario is correct then pensioners in particular and the funds that guarantee them have a hard road ahead. Real resources will have to be used to finance their income. Once again "boomers" and "zoomers" (pre-boomers) have managed in some sense to shift the burden back to future generations! Seasonally adjusted employment grew by almost 2 thousand in the month which is more than it had in the previous 12 months. Due to the small sample size of the LFS, employment figures seem to bounce around a lot and therefore vewers should not read too much into this increase. What is probably true is that employment is growing slowly say less than 1 percent per year. 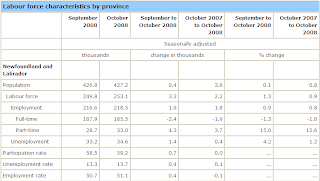 Confusing to most people is that when Statistics Canada says that employment in the Province grew by say 1% then it may not be. What is correct is to write that "employment of full-time residents grew by 1%." Many of these employees are working in other provinces such as Alberta. Therefore, we can expect to see our "employment" fall in the coming months as the North American recession passes through other provinces to the west of us. Unemployment rates have increased to 13.7% (seasonally adjusted). 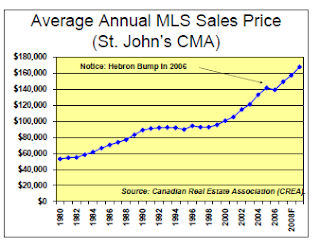 Commentators always note how the rate here is more than double the national average. Poor us! The reality is that this high rate simply reflects the rural nature of our economy with seasonal labour markets. This seasonality is supported by the regional extended benefits of our Employment Insurance program. While some may criticize the program for supporting unemployment, the flip side is that it allows many people to live in the rural parts of the Province at a higher standard of living than might otherwise be the case. A final note is that while the monthly LFS provides valuable labour market inforamtion for the Bank of Canada and Department of Finance officials it does little to help people understand the nature of labour markets in Atlantic Canada. In fact, it is misleading.